This packed two day course offers a thorough introduction to small powerboat handling. Level 2 is also the basic level required for the International Certificate of Competence for under 10m vessels (UK nationals only). The minimum age is 12 years but all drivers under 16 years must be supervised by a competent adult. Some previous boating experience will be an advantage. Launching and recovery, boat handling, securing to a buoy, leaving and coming alongside, man overboard. Self- sufficient powerboater in the right conditions, aware of own limitations and those of the craft. 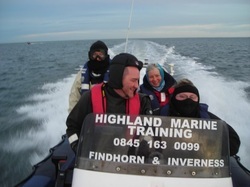 If you can’t find what you are looking for contact us on 01309690099 or watersports@findhornmarina.com.